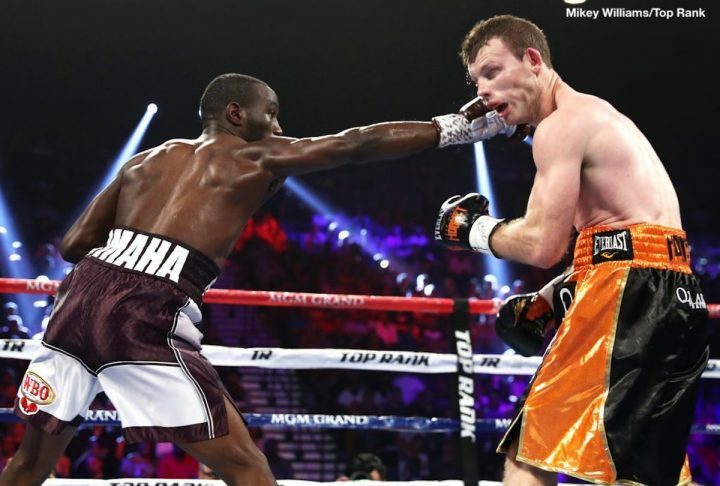 By Chris Williams: Former light welterweight unified champion Terence Crawford 33-0, 24 KOs) beat up and stopped WBO 147lb champion Jeff Horn (18-1-1, 12 KOs) in the 9th round knockout on Saturday night in his debut at welterweight at the MGM Grand in Las Vegas, Nevada. Crawford, 30, knocked Horn down in the 9th round. After Horn got back up, Crawford hit him with a series of hard shots that caused the referee Robert Byrd stepped in and stopped the fight. The official time of the stoppage was at 2:33 of round 9. Personally, I thought the fight was stopped too soon, but I’m not surprised that the referee Byrd stopped. Byrd is the same referee that arguably stopped the Floyd Mayweather Jr. vs. Conor McGregor fight too soon last year in August. That fight should have gone on longer, but Byrd stepped in and pulled the plug with McGregor still sanding and fighting back. Horn wasn’t going to win the fight, but the referee should have at least let the fight play out until the bitter end rather than prematurely ending the fight and robbing the boxing public from seeing the conclusion. After all, the boxing fans are paying $4.99 per month in subscribing to ESPN+. There aren’t too many other interesting matches on ESPN+. Horn had no defense at all tonight, and he was constantly coming forward with his head down like a Billy Goat. Crawford took advantage of Horn’s lack of defensive skills and gave him a pounding. Horn, 30, made it close in the first two rounds with his pressure attacks and his physical style of fighting. However, once Crawford figured out Horn, he was able to catch him with shots coming in and get out of the way of his return first. Crawford was landing a lot of counter shots, but he was getting hit. This wasn’t a shutout by any means. Horn was putting hands on Crawford. He just wasn’t powerful or consistent enough. Crawford constantly switched to southpaw stance, but without any noticeable improvement. It was just something Crawford would do to try and showoff but without it improving his game any. Crawford could do without changing southpaw and his game wouldn’t suffer one bit, as he does enough fighting out of the orthodox stance to win his fights against the guys that Top Rank has been matching him against. Horn was technically a world champion, but only because he fought 39-year-old Manny Pacquiao and beat him by a controversial 12 round decision last year in July. Most boxing fans thought the past his prime Manny did enough to deserve the win over Horn. Crawford picked up the WBO belt tonight, but he got off the weakest of the 147lb champions. A big deal was made about Crawford moving up to the welterweight division for this fight with Horn, but the reality is that Crawford is now at his natural weight. He was rehydrating to 160 when fighting at 140, so he was basically a weight bully when he was fighting at light welterweight. Horn would have been knocked out in the 10th round by Manny Pacquiao last July if the Filipino fighter had the conditioning to finish him off after he had him on the verge of a knockout at the end of round 9. Crawford did what an old and over-the-hill Pacquiao almost did last year. It would be nice to see what Crawford does against an elite fighter like Errol Spence Jr., Keith ‘One Time’ Thurman, Shawn Porter or Danny Garcia. Unfortunately, I don’t see Crawford ever fighting Garcia, Porter and Thurman. Those guys aren’t going to fight Crawford because he’s with Top Rank. Spence might fight Crawford, but not soon, because Top Rank isn’t going to want to risk putting their fighter in with a good fighter like Spence and watch him get beaten up and potentially knocked out. Spence would have beaten Horn a lot faster and easier than Crawford, because he’s simply a stronger fighter.